Nielsen social media study: Everyone's tweeting in the bathroom. Nielsen, the media-analytics and ratings firm, has published an important new study this week on the state of social media. Its insights are trenchant and wide-ranging, and they have given the media much to digest. You’ve got gender disparities in the amount of time spent on social media. You’ve got the rise of Twitter as a second screen. You’ve got Pinterest as the fastest-growing social network. 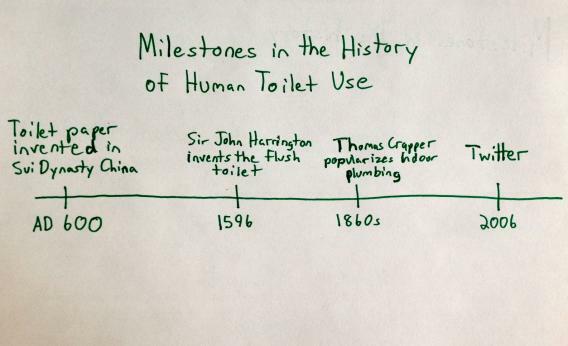 But most importantly by far, you’ve got nothing short of a paradigm shift in how Americans use the bathroom. Yes, according to Nielsen, 32 percent of young Americans between the ages of 18 and 24 report that they engage in social networking while on the pot. Nielsen did not report the numbers for other demographics. But it’s well-understood in the technology industry that the behavior of this bellwether group heralds the shape of things to come for the nation as a whole. In short, our days of leafing through newspapers and magazines on the commode are numbered. From a business standpoint, this amounts to another devastating blow for print media in general and Reader’s Digest in particular, though there may be a lag in circulation effects on the magazine’s large-print edition.